After being invited to discuss suicide in response to the suicides of Anthony Bordain and Kate Spade on RTHK‘s Backchat, I penned this stream of consciousness article trying to rationalize the spike in suicide stats (according to the New York Times, it has leapt in popularity as a life-obliterating lifestyle choice by 25% since 1999). Reliving my own flirtation with suicide, I started ruminating on what stopped me from revisiting that dark place in the hope it might help others. I doubt that in the final hours of their lives Anthony Bordain and Kate Spade were thinking about their celebrity, their achievements, their accolades, or wondering how their fans would respond to the news of their deaths. Suicide is a decision so impetuous that I don’t think it even qualifies as a decision. It’s an impulse born of chaos that wrecks lives and perpetuates mental illness, spiking stats, since those left behind are at high risk of developing mental health conditions like PTSD, depression and anxiety disorders themselves. A lot of people get very angry about suicide, even when it’s not their tragedy. It’s a very emotive subject. Nowhere is this better illustrated than in Hong Kong where if you’re trying to sell your property, you must lawfully declare whether anybody living there has committed suicide. If they have, you can forget selling at market value. As if the families of people who’ve committed suicide haven’t suffered enough? Despite this, much of the stigma surrounding suicide has lifted in recent years. To my mind, this marks hugely positive progress, helping loved ones come to understand that it’s not their fault. But there’s a flipside to every positive social change. By removing some of the stigma from a taboo subject, have we inadvertently made suicide more socially acceptable, desirable even? Especially to those who take their celebrity role models very, very seriously? I’ve known 8 people well who have committed suicide, whom I miss and think about regularly. And I’ve been suicidal myself once. It was just before I was diagnosed with bipolar disorder. I was having my first ‘mixed episode’ (acute mania and depression experienced simultaneously). I have no memories of what I was thinking. Just that I wanted it to stop. Like Bordain, I was alone in a foreign hotel room. I had 50 sleeping pills in my mouth. But I procrastinated at the crucial point. I spat out the semi-dissolved pills. 18 hours later, housekeeping woke me by pinching my nose and slapping me in the face. What I do know is that I’ve never once regretted not going through with the deed. In the words of Tyrion Lannister, “Death is so final!” So boring, I might add. So what can those of us who have sailed close to the edge realistically do to prevent ourselves from revisiting that dark and shadowy land of self-delusion? Attending therapy sessions and taking medications is the bare minimum we can do. But they’re a quick fix to plug a hole. Eventually, inevitably, treatment and medications will not produce the same fake sense of calm or fake happy endorphins. What then? More drugs?? I didn’t want to end up another slathering imbecile in the Army of the Dead. I’d taken enough recreational drugs to know the medications I’d been prescribed to help me manage my mood disorder would not be enough to keep me safe for long. They’d lose their magic power. Therapy would cease to be interesting. And soon I’d be paying HKD$3000 an hour just for the opportunity to zone out with a psychiatrist in the room. I needed a distraction – to fill my mind with stuff. So I decided to do what I’m bad at, which it turns out is practically everything. Hong Kong is a very success-driven society. We are programed from an early age to focus on what we’re good at. At the same time, we are naturally attracted to doing what we’re good at. If we’re good at it, it’s all we want to do. Praise is a drug and we crave it like addicts. We start to equate doing what we’re good at with being happy. We believe that if we achieve the pinnacle of success doing what we’re good at, happiness is assured. We make choices based on doing what we’re good at. The more gifted we are, the tougher the choices we have to make. Our lives and minds become streamlined. If we’re famous for doing what we’re good at, there’s no escaping what we’re good at. The evidence is everywhere. We’re reminded of it constantly. But what if doing what we’re good at no longer makes us happy, if it ever did? It could even make us unhappy, especially if we only spare the time to do what we’re good at. Where is there left to go? How do we continue to grow? If we only do what we’re good at, our identity becomes synonymous with doing what we’re good at. If we stopped doing what we’re good at, we’d cease to exist. Even if we do defy the odds and reach that illusive pinnacle of success, we risk discovering that contrary to all our previously held beliefs, we could on no account accurately describe ourselves as ‘the happiest person on Earth’. We start to resent the time we spent doing what we’re good at. A vacuum opens, a void of emptiness and nothingness. It’s a long way down from the pinnacle. Terrifying from any level. We realize with a shudder that negotiating voids is not something that we’re good at. So instead of sitting in a circle, support group-style, reliving the sort of memories that most of us would do better trying to forget, perhaps our goal should be to make glorious mistakes doing what we’re bad at. There’s nothing funnier, nor more liberating, than discovering we truly STINK at something! And if we’ve already accepted we’re doing what we’re bad at, what have we got to lose? Of course there’s always a slight risk we might accidentally get good at doing what we’re bad at. But in the unlikely event this happens, try not to despair! Both outcomes are equally positive. It’s easier to love doing what we’re good at for longer if we’re balancing it by focusing with the same passion and intensity on doing what we’re bad at. If we only do what we’re good at, we risk experiencing every arbitrary rejection and negative comment as a knife wound to our hearts. If we only do what we’re good at, we’re far more likely to equate criticism with the most paralyzing form of personal failure. Shame is not a creative emotion, even if it’s what we’re good at. So keep doing what you’re bad at. It’s the best way to live. Sadie Kaye is a writer, filmmaker, RTHK presenter, founder of Bipolar Hong Kong and creative director of Mental Ideas. 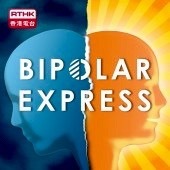 Want to write for Bipolar Hong Kong or Mental Ideas? Drop us an email with your op-ed! For international suicide prevention hotlines click HERE!